While Alhaji Sikiru Ayinde Barrister may not be the go-to floor-filler on a Friday night, his unique blend of west African spiritual rhythms still energize the soul like a Pelanga dance floor! As if the faded carnival font and dapper 70’s fashion were not a strong enough lure, our featured musician is rockin’ some turquoise leather shoes! Don’t know about you, but that’s evidence enough for me to drop a few dollars and take the risk of buying an unknown record. I figured a man with such style, yet laid back enough to take time out to smell the flowers would surely create some high quality music. 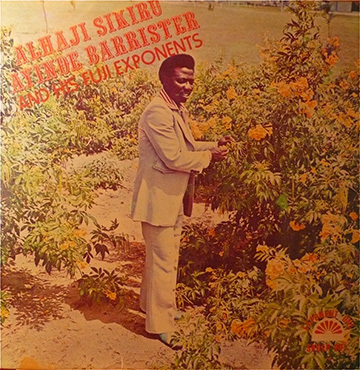 Well, for our listening enjoyment Alhaji Sikiru Ayinde Barrister and his Fuji Exponents produces just that…the kind of music that instantly soothes the soul and leads those unfortunate enough not to speak the Yoruba language to ask “what on earth is he saying”? A brief internet search quickly informs me that as far as the Nigerian musical style of Fuji is concerned I’ve tapped the source. As it turns out, Alhaji is not only the father of Fuji but was also an early master of it’s musical precursor Were/Ajisari, a genre traditionally performed before dawn during the fasting season of Ramadan. According to the spiritual leader and master musician, Fuji music is named after the Japanese mountain of love and is a combination of Sakara, Apala, Juju, Aaro, Gudugudu, and Highlife. With over 150 albums recorded up until his passing in 2010, Alhaji helped cement the Fuji sound in the popular culture of Nigeria, where it continues to flourish today. Listen to this incredible self-titled album in its entirety here! This entry was posted in PELANGA RECORDS! and tagged Alhaji Sikiru Barrister, DJ Smokestack, Fuji, Nigeria by Smokestack. Bookmark the permalink.